Beaches Living website, www.beachesliving.ca is your Community Information Hub with over 40,000 visitors every month. These visitors are searching for shops, products, services, promotions, contests and events in the neighbourhood. 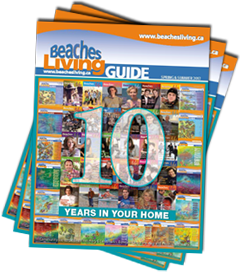 The website is the online version of our award winning print publication Beaches Living Guide. The online complimentary listing is now open to all local businesses in Toronto Beaches, Leslieville neighbourhoods (postal codes: M4E, M4L). Additional surrounding postal areas will be added at later time.